When was the last time you applauded a company? On a Southwest Airlines flight to Austin for South by Southwest a couple weeks ago, our plane was delayed due to a flat tire. The tire was changed in about 30 minutes, and we were on our way. The flight landed late in Austin of course, but as we were landing the senior flight attendant made a full-blown, four minute apology that recognized that times were tough, we have choices when we fly, that Southwest values us as customers, that we are all (employees and passengers) part of the Southwest team, and that on behalf of the entire airline, they were very, very, very sorry. …and the passengers broke out into applause. It wasn’t thunderous, standing ovation applause, but more like stunned gratitude in the “I can’t believe I just heard that, but I sure like how it sounded” vein. 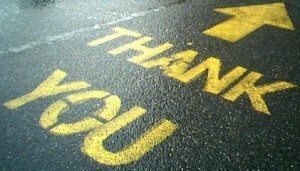 In this economy, where it might just be smarter to focus ONLY on your current customers and not worry as much about finding new ones, let’s commit to new methods of saying thank you. Tony Hsieh from Zappos.com emphasized at his South by Southwest keynote address that customer service should be conducted in a public forum wherever possible, because it’s a reminder that you care about all customers, and it helps set norms within your customer community. Use Web-based support, FAQs, and other tools to capture customer feedback and make it viewable. Link to blogs posts or reviews that mention your company. Ask your customers for permission (to avoid spoiling any secrets) if you can use their names as a customer, and if they agree have a “Thank you to today’s customers” page or scrolling ticker on your Web site or blog. Instead of the boring email confirmation that says the order has been received, why not use triggers to send your e-commerce customers a full-color postcard the next day that includes a photo of the product(s) they purchased, a thank you note from the CEO, and a discount for a future order? Three days after the order ships (or after your Webinar or conference), use triggered messaging (my client ExactTarget offers this service) and automatically send voice mail messages from your CEO making sure that satisfaction was high and asking for feedback via phone, email, twitter, etc. If you mess up somehow and have to apologize to customers, consider doing so in as broad a forum as possible. Remember, trying counts in social media and even although it’s paradoxical spotlighting a problem (and how you solved it) can be more beneficial than trying to keep the problem quiet. Don’t delete negative comments on your blog or Facebook page, address them. The Southwest flight attendant didn’t apologize individually on our way out the door, he apologized over a microphone. Are you ready to go public?